Some friends and I went to see Particle Fever this evening at the Film Forum. 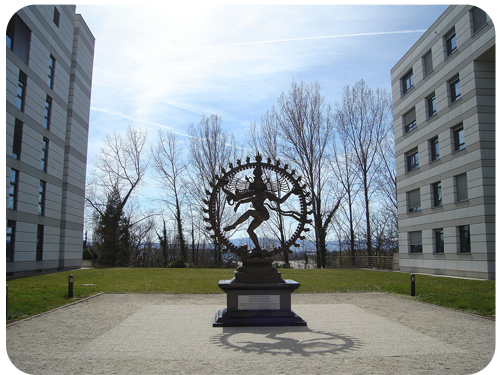 After the the opening credits and before the narrative began, there was a 3-4 second still shot on a statue of Shiva (turns out the statue is actually in front of a CERN building). The film returned to the same shot prior to one of the climax scenes. I still wasn’t sure why, but it was definitely foreshadowing. At the end of the film, the scientists described the Higgs particle as both the potential creator and destroyer of the universe — thus the Shiva connection. I’ve never followed a religion and have only recently begun to explore the philosophy of yoga. I’m also accepting my gradual softening to the term spirituality and what it means to me — something that I’m exploring more actively and openly. Right now I’m spending some time with the Yoga Sutras, specifically the Chapters on Contemplation and Practice. In the translation that I’m working with, in the commentary about 1.17 (Samprajnata Samadhi is accompanied by reasoning, reflecting, rejoicing, and pure I-am-ness), the author notes that “yoga says god is just the pure consciousness”. I’m not entirely sure what that even means yet, but for the first time it’s a phrase with the word god in it that doesn’t make me want to close the book and throw in the trash. To coincide with studying the Sutras on Practice, I’m trying to take note of how the Yamas (contracts with others) and Niyamas (contracts with the self) are currently shaping my life by keeping + and ∆ list for each of the ten contracts. I’ve never had a formal set of ethical codes by which I lead my life, and these are appealing to me because they are principles that, if followed, lead to happier lives for everyone. Ishvara Pranidhara, one of the Niyamas, is surrender to [insert god and/or god-like meaning here]. But before I can surrender, I need to figure out what I’m surrendering to. I think this Frank Lloyd Wright quote sums up where I’m currently at — “I believe in God, only I spell it Nature.” — and I think that’s an OK place to be right now.